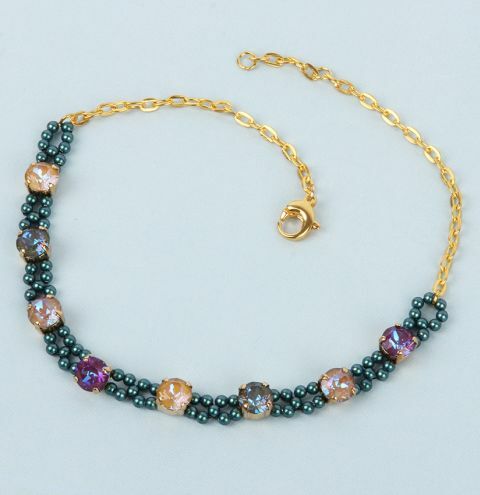 Learn how to make this Swarovski Chaton choker - perfect for glamming up an outfit for the festive season. Cut an arm span of thread and string x1 pearl so it sits in the middle of the thread. Onto each strand pick up x2 pearls and then straight through a chaton setting. Now pick up x2 pearls onto each strand, cross both through x1 pearl, pick up x2 pearls onto each strand and pass straight through a chaton setting. Repeat step 3 until all your chatons are added, then add x2 pearls onto each strand and cross through x1 pearl. For a loop by picking up x6 pearls onto one strand and then passing the other strand down through these x6 just added. Cross both through the next bead already added so you have a strand coming out of either side of the middle pearl. Work your way back through the beads add until you exit the very first bead added in this design. Pick up x6 beads and form a loop to match the other end and continue through the beads in the design. Knot and trim the excess. Take the other strand and pass it through the beads, working you way to the other end. Pass through the loop to reinforce. Pass through some of the other beads and then knot and trim the excess. Measure the chain to the choker and cut the right size piece for your neck. Cut this chain piece in half and add one to one end with a jump ring, then add the clasp to this piece. Add the other chain piece with a jump ring, then add a jump ring to this piece to fasten. If you wish you can then add an additional inch of chain to this as an extension chain.